With over fifty years of manufacturing and sales experience, Sundance Trampolines can match you with a high-quality trampoline that will keep your family bouncing for many, many years. Sundance stocks trampolines that range from recreational playground equipment to professional competition designs. Every trampoline is built with extra-heavy duty springs and uses durable, outdoor fabric for its jumping mats. Sundance Trampolines also have precision-crafted anti-flex frames and the thickest safety pads available. With over fifty years of manufacturing and sales experience, Sundance Trampolines can match you with a high-quality trampoline that will keep your family bouncing for many, many years. Sundance stocks trampolines that range from recreational playground equipment to professional competition designs. Every trampoline is built with extra-heavy duty springs and uses durable, outdoor fabric for its jumping mats. Sundance Trampolines also have precision-crafted anti-flex frames and the thickest safety pads available. 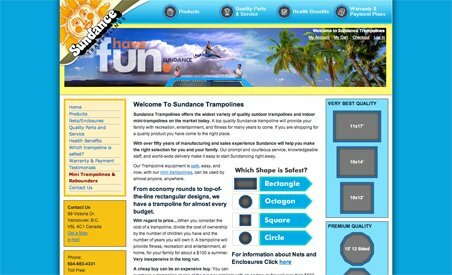 Sundance is based in Vancouver, British Columbia but can ship their trampolines worldwide.